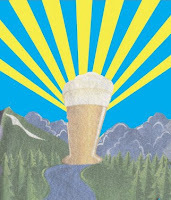 This blog launched five years ago with a piece about the upcoming Oregon Brewers Festival. At the time, I certainly didn't know where it would lead or how long it would last. I only knew I had more to say about beer and the beer scene than I could ever get published via traditional media. I chose to write about beer after several beer-centric articles published in digital form drew a fair amount of attention. I could have chosen another topic. But I had a history with beer dating back 20-plus years and it was something I knew I wouldn't mind spending some time with. To be honest, I thought the blog would help me maintain and maybe expand my writing, research and project management skills. I used those skills extensively in the marketing communications work I did 1993-2009. I thought keeping those skills up might help me return to that work. If not that, maybe it would help me get a gig where I could use those skills. I never seriously considered the possibility that the blog could make money. That's a tough nut to crack unless you get a ton of traffic. If making money had been my goal, the site would be much more of a promotional vehicle. That was never a possibility. We have enough promoters and industry shills writing blogs and print articles as if they're objective journalists. They aren't. The price of writing mostly objective content is you make enemies. The articles that have generated the most traffic here have invariably dealt with the shadier side of the industry. Anheuser-Busch and its owned craft breweries have been a popular target. Several of those pieces have drawn more than 20,000 page views. And counting. The enemy count has risen, as well. Some of the articles I enjoyed writing the most include personal reflections of what it was like in the pre-craft era. This week's piece on Lucky Lager was a fun one to write. Last summer's piece on my experience as a bartender at Coeur d'Alene's Rathskeller Inn during the summer of 1975 was another one I had fun with. There are others. Writing about beer is mostly a fancy hobby. If you're good, you might actually get paid for that work. Jeff Alworth does. Brian Yaeger does. I've written articles for BeerAdvocate and for various print and digital media outlets. The blog certainly helped me get that work. It also helped me get the contract to write Portland Beer, published in 2013. But that work is not as lucrative or accessible as many imagine. It was clear to me some time ago that the blog and the freelancing are not a viable career. Neither are they a way back to my former career path. There's no reason to delve into the details, except to say employers aren't remotely interested in people my age. Experience and skill set aren't really a factor. Of course, there was always the possibility of beer industry work. That was never much of a motivating theme, though I have floated resumes or applied for a handful of industry jobs. Nothing came of those opportunities. In the cases where I was interviewed, I always learned I just wasn't quite the right fit. Nothing personal, you know. Looking back on five years, I'm mostly satisfied with the variety and quality of coverage I've provided here. There have been highlights and lowlights, for sure, and I've learned a lot about beer and the beer industry along the way. I've also made a lot of friends to go with more than a few enemies in the beer community. Many more friends than enemies makes it worthwhile. Still, the reality is the reasons I originally created the blog have evaporated. There's simply no reason to continue on with it if the goal is some sort of professional upside. That's a fantasy. I've essentially passed the point where many blogs begin to fade from sight without notice. I've seen it happen countless times. I don't have a crystal ball and I know the future is uncertain. I won't stop writing, but my efforts along those lines will likely take on a lower priority as I focus on something with a greater potential upside. I'll have more to say about that in due time. For now, accept my thanks for stopping by from time to time over the course of the last five years. Without readers, this site is nowhere.